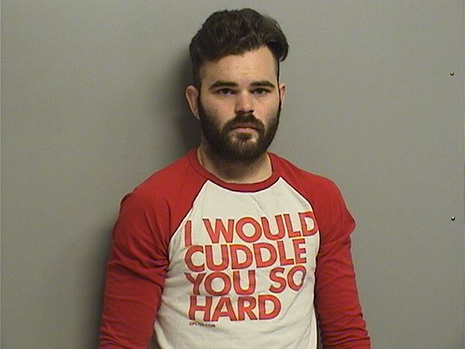 The Oklahoman, 23, was booked into jail Saturday evening wearing a t-shirt that might have given fellow inmates the wrong idea. Seen above, Tucker was collared by Tulsa cops for possession of marijuana with intent to distribute, contributing to the delinquency of a minor, and possession of drug paraphernalia. Tucker spent several hours in the county lockup before he was released early Sunday after posting bond on the felony and misdemeanor counts.